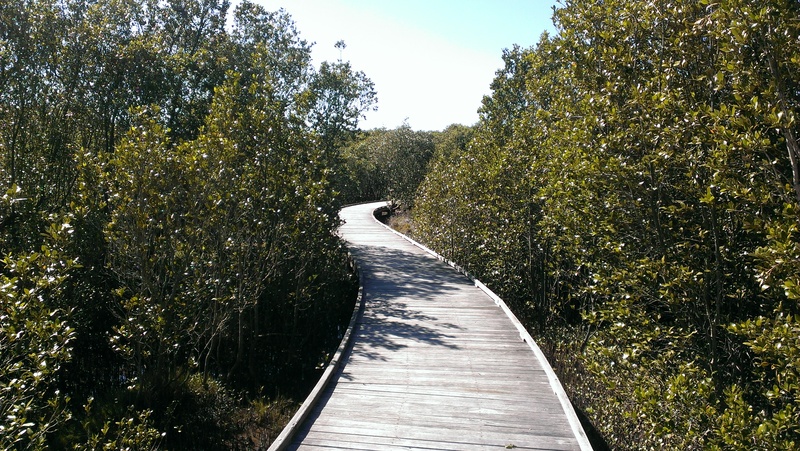 Summary: Explore the Hunter Kooragang wetlands on Ash island! There are multiple walking tracks and a teeming birdlife, as well as an abundance of frogs and butterflies. This walk has essentially no elevation and would be good on a bike also. This walk starts at the National Park Visitors Centre (Schoolmasters House) on Ash island, part of the Kooragang wetlands. When going on Pacific Highway to Newcastle from Maitland there is a turn off on your left. Go across the bridge and then right at the first intersection onto Schoolhouse road and the turn-off to the old Schoolmasters House is on your right shortly thereafter. Around the back of the house there is a path that takes you to a boardwalk. Turn right and follow it along the mangroves and above mudflats, with interpretive signs along the way. When you get back to the road, cross over and look for the path through the forest. This meanders through the rainforest before joining up with the gravel road along the waterfront. Keep walking on the gravel road, past a house and a gate. 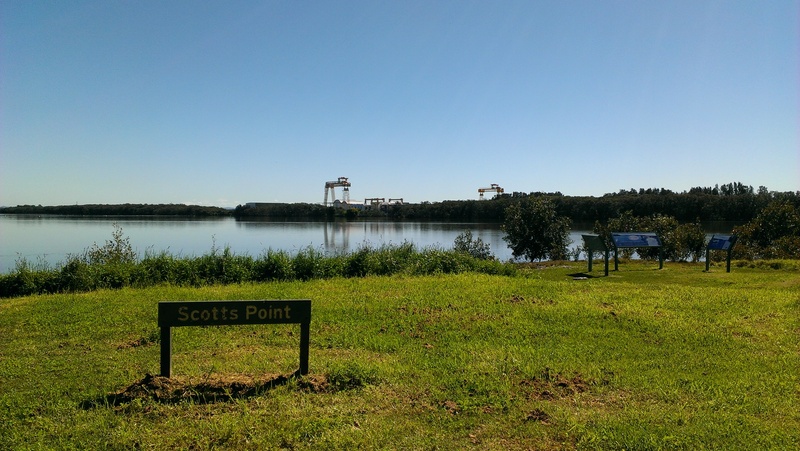 Eventually you will get to Scott’s point which offers views across the Hunter River to the industrial area on Kooragang island. This is also a favourite spot for fishing. Keep walking around the point and continue until you get to the Riverside park. Turn right and walk down the gravel road to the main road (Milham road). Turn right again and be careful walking along the side of the road as there is not much room and the few cars that venture out here typically drive quite fast. You will pass a couple of silos and a parking area from where there is a path through the rain forest, which will take you back to the gravel road towards Scott’s point. This path is not suitable for wheels and tend to be a bit wet after rain periods, but may be worth the effort as it goes across some wetlands often full of birdlife. If you choose to take this path and then work your way back to the Schoolhouse it will add 900m to the walk. 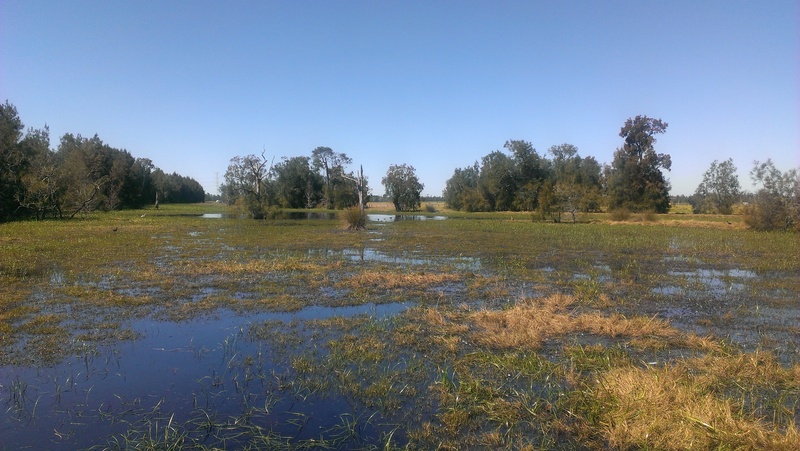 This entry was posted in Newcastle and tagged Newcastle, Wetlands by locwalker. Bookmark the permalink.